Buy online Ditra 323 sq. ft. 3 ft. 3 in. x 98 ft. 5 in. x 1/8 in. Uncoupling Underlayment for Tile DITRA30M and leave review or share with Your friends. 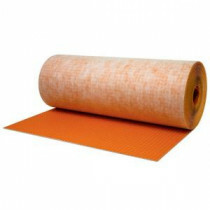 Ditra is a polyethylene uncoupling membrane. It has a grid structure of square cutback cavities with an anchoring fleece laminated to the underside. The open rib structure allows for in-plane movement, which effectively neutralizes the movement stresses between the substrate and the tile to prevent cracking. The thickness of the tile assembly is minimized by using Ditra, which is only 1/8 in. thick. Roll dimensions are 3 ft. 3 in. x 98 ft. 5 in. Membrane thickness is 1/8 in. Roll covers 323 sq. ft.
Installs over a wide range of substrates, including plywood/OSB, concrete, gypsum, heated floors etc.